Experiential education is somewhat organic and therefore has been utilised for centuries in the form of apprenticeships, military training and agriculture. The formal educational model known as EE (Experiential Education) is a modern development though. Associated with this model you will find the names of educational researchers such as Hahn, Joplin and David A. Kolb, who theorised a continual three-point process of learning, incorporating: Knowledge –> Activity –> Reflection and back to Knowledge again – something like Action Research. I hasten to say that not all experiential learning is based on sound models and principles. I recall the day I decided to give my dad a hand with fuelling up the family car. I was one of three boys and I was keen to please my dad, so when I overheard him tell mum that he needed to fill the car, I came to the rescue and proceeded to ‘fill the car’– sadly with water rather than petrol. I would have to say in retrospect, that the impact on Dad hovered somewhere between utter horror and abject despondence. Of course, he spent the rest of the day draining the fuel tank, cleaning as much of the water out of the fuel lines as possible and ruminating on a day wasted. A real life problem to solve – My dad’s car had an empty petrol tank. An enthusiastic creative person, keen to engage with solving the problem – eight year-old me – despite being misguided and minimally informed. A hypothesis to explore and a solution to offer – I wonder if my Dad would be happy if I filled the fuel tank my way? A test for the hypothesis – I filled the fuel tank – with water. Timely feedback regarding the results of the test – Dad having a conniption over my efforts to solve the problem. Informed reflection on the results of my test – Giving consideration to my ‘solution’ and ‘dad’s conniption’ – I will do something different next time; ‘not happy Jan’. Unlike the fuel tank story above, it’s not all down to guess work, it’s an organised community event; there’s a strong correlation with the ‘real world’ and it mimics the way adults deal with the day-to-day issues of life. Creative and critical thinking is central to answering questions and there is time built into the process to reflect on what happened and what the results say about actions taken. Consideration is given to what happened in the experience and what needs to be done next. In this EE Model, results, including mistakes, become opportunities for learning and challenges that empower learning. Sadly, dad did not know about these wonderful principles but even if he had, I still do not think he could have let me near his car. 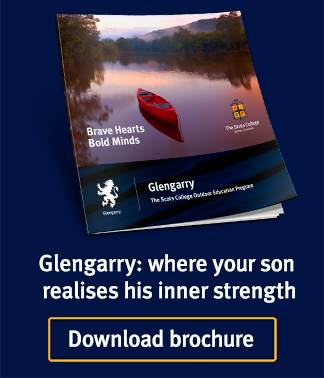 To learn more about The Scots College’s approach to experiential learning via the unique outdoor education residential experience at Glengarry, download our Glengarry brochure. Mike Pitman is the Director of Glengary at The Scots College. Glengarry is a six-month residential experience for all Year 9 students at Scots.